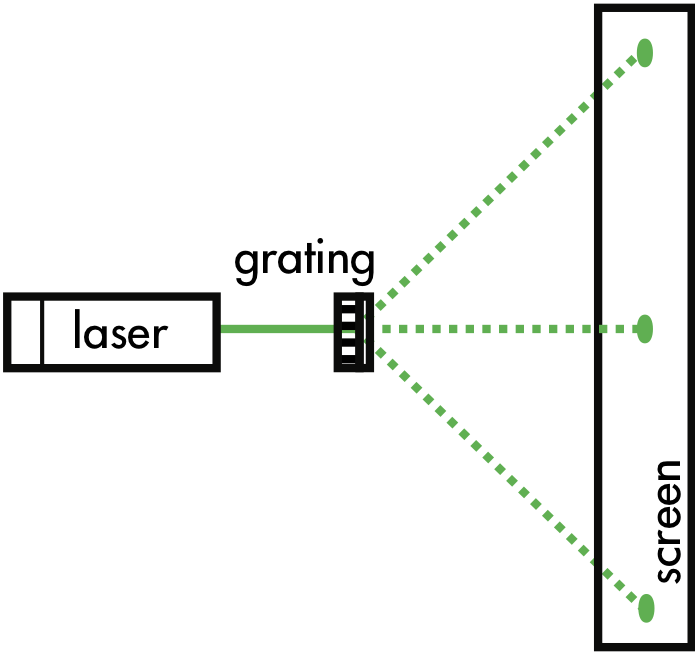 A green laser (wavelength 550 nm) illuminates a grating with a unknown spacing between adjacent slits, producing an interference pattern with a first maxima angles of ±32°. (Drawing is not to scale.) Discuss why it is not possible for second maxima angles to be produced by this grating. Explain your reasoning using the properties of source phases, path lengths, and interference. solving for the second maxima angle results in a domain error for the inverse sine function, and interprets this as meaning that the there is no defined second maxima angle. As (p), but argument indirectly, weakly, or only by definition supports the statement to be proven, or has minor inconsistencies or loopholes. Typically has math errors. Nearly correct, but argument has conceptual errors, or is incomplete. Uses minima equation and/or compounded math errors. Limited relevant discussion of supporting evidence of at least some merit, but in an inconsistent or unclear manner. Some garbled attempt at applying properties of source phases, path lengths, and interference. Implementation/application of ideas, but credit given for effort rather than merit. No clear attempt at applying properties of source phases, path lengths, and interference.